​The Ukrainian parliament has approved amendments the 2015 budget that sees drastic pension cuts and energy bills tripling. The changes are needed to comply with the terms of the agreed $17.5 billion IMF bailout package. The budget amendments were passed at an extraordinary meeting on Monday with a majority of 273 votes, well above the minimum 226 votes necessary to pass legislation. According to the changes, Ukraine’s budget deficit increases from 3.7 percent to 4.1 percent of GDP. Amendments envisage the expenses increasing by about $1.3 billion (35 billion hryvnia), with a 21.7 hryvnia per dollar exchange rate. At the same the cabinet plans to cut government funding of Naftogaz in 2015 by 5.8 percent to 29.7 billion hryvnia. The changes also see a cut in pensions for retired people by 15 percent. Moreover, pension payments for people working in the tax, customs and regulatory bodies, will be suspended. The job tenure for people working in hazardous and heavy industries will be gradually increased from 20 years to 25 years for men and from 15 years to 20 years for women. The amended budget provides for increasing the rent charged for gas production from 20 percent to 70 percent. At the same time Ukraine’s national commission responsible for controlling energy and utilities has more than doubled the cost of gas to average consumers. Thus, gas used for heating will jump 230 percent to about $132 per 1,000 cubic meters. The price for gas used in cooking and heating water is expected to skyrocket from $43 to $263 per 1,000 cubic meters. Ukraine is undergoing a serious political crisis that affects its economy and the public sector, in fact, the country is on the verge of default. Authorities hope to improve the situation by means of foreign borrowing. The IMF two-year loan program for Ukraine is worth $17.5 billion. The overall financial assistance from the IMF and other sources could be as much as $40 billion. The IMF is expected to approve the new aid package to Ukraine on March 11, 2015. Ukrainian Prime Minister Yatsenyuk is sure the International Monetary Fund will agree. 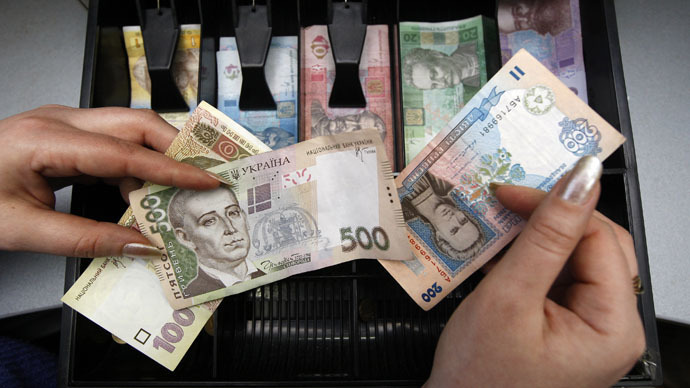 He says external financing will increase foreign exchange reserves, which will help stabilize the hryvnia which has lost around 70 percent of its value since the crisis begun a year ago. Nicholas Burge, the head of the trade and economic section of the EU Delegation in Ukraine suggests the country’s reserves are a third of what is needed. Ukrainian reserves stood at $6.42 billion on February 1, 2015, enough to cover about five months of import. Inflation in Ukraine is officially running at 28 percent, American professor Steve Hanke in his blog last week suggested it was more like 272 percent.